There are various products of Juvederm Ultra which is 3D hyaluronic acid matrix dermal filler that is used for skin treatment. In addition to non-animal hyaluronic acid, it also contains lidocaine, local anesthetic that provides more comfort before and after injection. Why to Use Juvederm Ultra? Juvederm Ultra is used to improve the skin hydration and elasticity. It is most suitable for the person with dry, dull looking or other minor signs of aging, such as fine lines or wrinkles. The treatment is been done by a licensed medical practitioner who has undertaken training in injection techniques. How Juvederm helps to achieve the results? By having the treatment with help of Juvederm it improves the skin hydration by delivering deep hydration. Once after replenishing, the skin becomes firmer, smoother giving a refreshed appearance. The most noticeable areas for this treatment is the face, neck, décolletage, and hands. One of the most fundamental ways to the fresh appearance of the face is the skin hydration with help of Juvederm, else without hydration, many efforts are needed to reduce and repair the signs of skin damage. What are the areas treated with this product? This is a specialized skin booster that can be applied on patient’s body like the back of their hands, their neck, and their décolletage or on their face. After receiving with the treatment of Juvederm it makes the skin more vibrant and younger looking with skin glow. There are also several other benefits of Juvederm that is been described as follows. Juvederm Ultra Smile – is used for the treatment of lips and mouth area. Helps to enhance lip volume, redefine lip shape, treat vertical lip lines and depressions at the corners of the mouth. Juvederm ULTRA 2 – Especially used for treatment of fine lines. Juvederm ULTRA 2 helps to treat corners of the eye and those very close to the surface of the skin. 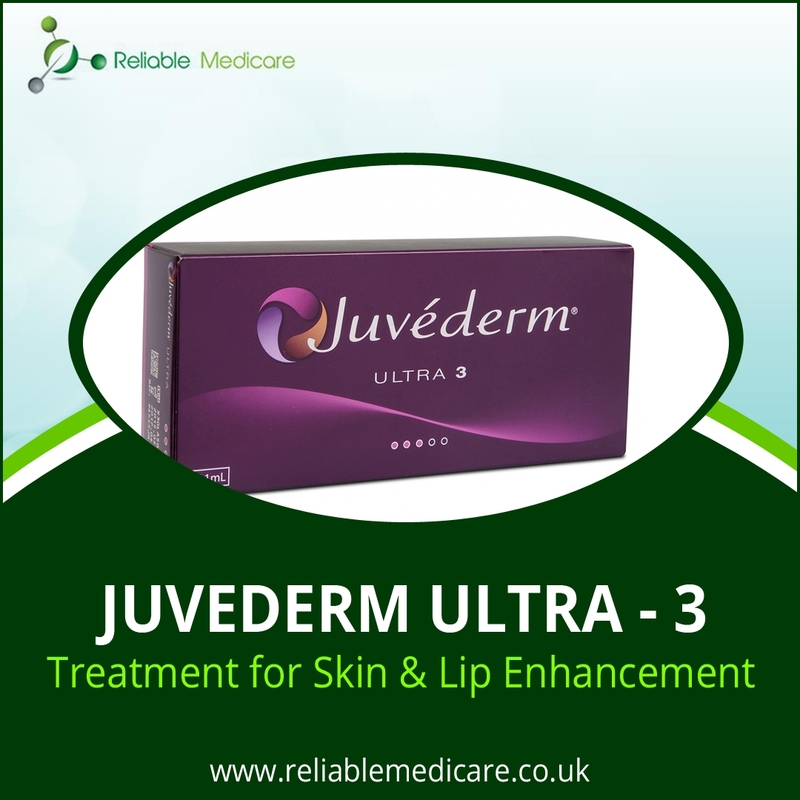 Juvederm ULTRA 3 - Juvederm ULTRA 3 is used for treatment of deep wrinkles like those between the nose and corner of the mouth. Juvederm ULTRA 4 - Smoothes wrinkles located between the nose and the corners of the mouth, and around the lips. Juvederm ULTRA 4 also helps in deep depressions of the skin as well as for lip enhancement and cheekbone augmentation. Juvederm Ultra effectively helps to replenish depleted levels of hyaluronic acid in the skin for the restoration of natural and healthy glow. It helps to hydrate and adds volume to your skin. Rather than this, it helps to attract and hold moisture with the skin making it smooth, soft and toned. Its autooxidising agent helps to prevent build up free radicals. For a complete solution to skin treatment, Reliable Medicare is a distributor of Aesthetic equipment, Orthopedic and Cosmetic Supplies. We offer the highest quality skin treatment products to doctors, medical clinics, hospitals, pharmacies, and any other licensed medical institutes. Along with this, we offer Juvederm products for the skin treatment that is been classified by American Society of Aesthetic Plastic Surgery as the most popular, non-surgical, anti-aging treatment.